SP-Series SPRING CLUTCHES - Tiny Clutch | Helander Products, Inc.
SP-Series Tiny-Clutches are versatile line of wrap spring clutches available in the following configurations: Overrunning, On-Off, Indexing, Adjustable Indexing & Positive Stop Indexing. The various configurations allow great flexibility in application. The basic spring clutch consists of three parts: an input hub, an output hub, and a spring. The greater the force the tighter the spring grips the hubs. When the rotation is reversed, the spring loosens its grip and slips. In the free direction there is slight drag caused by the spring being slightly smaller than the drums. SP-Series Tiny-Clutches are available for shafts up to 16mm & torque loads up to 250lbs-in | 28.2Nm. 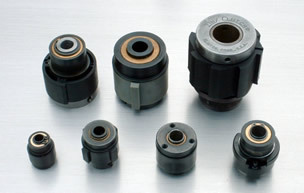 Special input or output hubs are available upon request to suit customers' needs. We will design & build special or modified clutches for your application using stock components. Clutches can be supplied with gears, sprockets, pullies or as complete mechanical assemblies consisting of clutch, shaft and adjacent parts. We produce a range of solenoid actuator brackets available for each model of SP-Series clutches. These brackets are an easy way to mount a solenoid, for applications requiring an electrical trigger. Contact Us for details.